ThermalDry®’s decorative, modular tiles are available in five styles. From front to back: oak parquet, grey sandstone, canyon beige, charcoal carpet, and mocha carpet. You can install just about any type of flooring in a finished basement. When the installation is complete, your new floor will look great. But how long will it stay that way? Eventually, many flooring materials that do well upstairs end up deteriorating in the basement simply because of higher moisture levels. This even happens in a "dry" basement because of concrete's ability to absorb and release moisture, and because of occasional spills and water leaks. ThermalDry® flooring is designed specifically for basement use. It's the smart, beautiful, long-lasting alternative to "above-grade" flooring treatments that will withstand any basement conditions. They can give you the look and feel of wood and carpet without any of the drawbacks of obtaining moisture and growing mold. Listed below are all the benefits of the ThermalDry® Basement Floor Systems and the 4 simple steps it takes to have them installed. Contact your TBF dealer for a free estimate for this patented product's installation! Nubbed underside of tile creates a thermal break (to keep floor surface more comfortable) plus drying and drainage space beneath tile. Attractive finished surfaces available in different styles. Snap-together transition strips also available. Only ½ in. thick; won't steal valuable headroom. 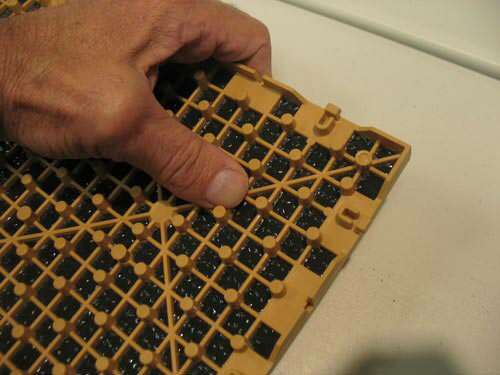 Plastic base material is immune to moisture damage. No warping, cracking, or delaminating. Tile's won't support mold growth or be damaged by mold. Can be installed directly over a concrete floor. Snap-together installation: no fasteners or adhesives required. Here's how we designed the perfect basement flooring –in 4 steps. Start with the right material. The first rule we established for our basement flooring was simple: It should never, ever be damaged by water or moisture of any sort; and it shouldn't support mold growth. Right away we had to rule out all wood products. Our sure bet for a totally waterproof, mold-hostile material was premium-grade PVC (polyvinyl chloride), the same impervious plastic used to make plumbing pipes. Our flooring isn't just waterproof. It's also strong, durable, flexible and stain-resistant as close as you can get to a maintenance-free material. Nubs on the back of ThermalDry® tiles maintain an air space between slab and flooring surface. Use nubs for drainage, comfort & strength. Now take a look at the underside of a ThermalDry® flooring tile. 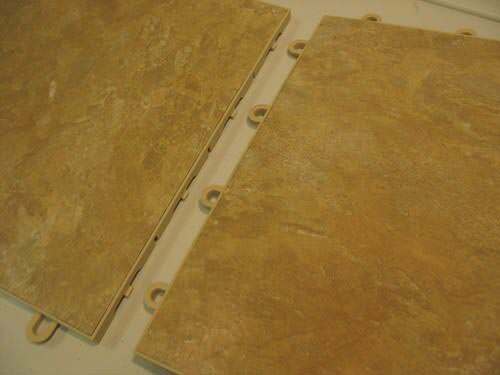 Instead of a thick, solid layer of PVC, our tiles are nubby underneath. The nubs are important for several reasons. For starters, they create a drainage plane beneath the finished floor surface, allowing water to drain or simply evaporate rather than get forced up between flooring tiles. The nubs also help to create a thermal break between the concrete and the finished floor surface. The air space provides insulation value, which helps a ThermalDry® floor to be warmer underfoot (about 10degrees warmer than the concrete floor surface). Finally, our nubby design also enables ThermalDry® tiles to provide solid support over a rough or slightly irregular concrete surface. Instead of cracking like ceramic tile flooring often does, ThermalDry® can flex. Interlocking tabs make it easy to remove and reinstall tiles should you ever need to. Engineer an interlocking design. Wouldn't it be great if you could install basement flooring without glue, nails, screws, adhesive or grout? We definitely wanted our flooring to be easy to install. That's why ThermalDry® flooring tiles simply snap together. The joints are self-aligning; you can't put tiles together the wrong way. And the interlocking joint design is strong but reversible. It's as easy to remove a tile as it is to install one. Since all styles of our ThermalDry® flooring tiles share the same interlocking design, you can create a basement floor by combining different styles. Add style with a variety of surface finishes. To suit different functions and satisfy a wide range of style preferences, we created plenty of style options in our selection of ThermalDry® flooring. 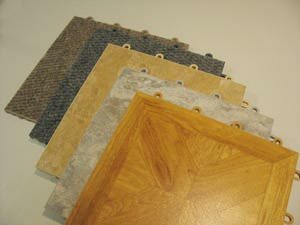 ThermalDry® "matting" tiles have an unfinished top surface that provides the perfect base for carpeting. We also have carpeted ThermalDry® flooring tiles, as well as tiles finished to look like ceramic tile or oak parquet flooring. Instead of installing a basement floor that you'll have to replace after it gets damp and moldy, why not do it right the first time, so you don't have to do it over? ThermalDry® flooring is designed to look better and last longer than any other basement flooring available. It's a beautiful finishing touch for your basement. Contact Total Basement Finishing today to get a free quote to install new basement flooring in your home!